This complex replaces the elaborate c. 1888 villa (see cover) once occupied by William N. Blackstone (1853–1907) and his wife Julia Squires Blackstone (d. 1941). William Blackstone was the son of the prominent Norwich rubber merchant Lorenzo Blackstone (1819–88), who lived at 138 Washington Street. Lorenzo served as mayor of Norwich and as a state representative and senator. 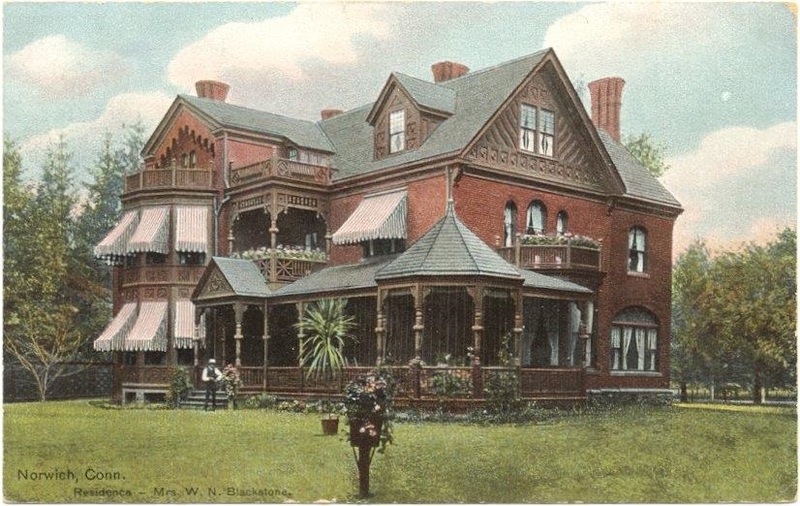 William followed in his father’s footsteps in commerce and was “universally esteemed for a business life above reproach.” The site is part of a large tract used for centuries by Mohegans as a royal burial ground and the object of ownership disputes raised by the Native Americans in the early 1900s. Those issues were finally resolved in 1906—largely in favor of the affluent residents who had already built houses here. William Blackstone lived at this address with Julia until his death in 1907. To the south of the Blackstone Apartments is the Royal Mohegan Burying Ground Monument. More information about this site can be found on the Walk Norwich: Uncas Leap Trail. Look for the interpretive sign at the entrance to the property.